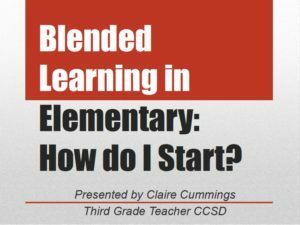 I had the privilege of presenting yesterday at the CUE-NV State Conference to a group of enthusiastic tech-loving educators who spent their Friday evening learning about blended learning. Claire Cummings is a third grade learning facilitator (aka teacher) and former instructional coach in Las Vegas, NV. She currently works at the nation’s first Marzano Academy, a personalized, competency-based STEAM magnet school. Claire is an Online/Blended Certified Teacher and former education newspaper reporter.